LIH YEU SHENG INDUSTRIES CO., LTD.
LIH YEU SHENG(= LYS) has over twenty-eight years of practical experience since we founded in 1988, we continue to improve our manufacturing and R&D ability to achieve and fit the market-trend. LYS has several CNC machines and high precision equipments to assure the quality promise and the mass production schedule. With the development of "Internet of Things (=IoT)", RF relative products are not only with wider application, but also with higher the quality-requirement. LIH YEU SHENG have faith that our products enable to match your application absolutely. 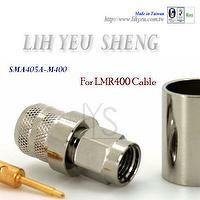 LIH YEU SHENG's product lines are included SMA connector, RP-SMA connector, N-Type connector, SMB Female connector, MCX connector, RF Adapters, and RF cable assembly for the application field involved telecommunication, automotive, test measurement, marine instrumentation, military, medical instrumentation, industry, and aerospace, etc. LYS connectors are segmented as DC-6GHz, 12.4GHz, 18GHz, 26GHz applications. LYS adatpors are used for DC-4GHz, 6GHz, 10GHz, 18GHz applications. You could follow your actual operating frequency to choose the proper connector and adapter.